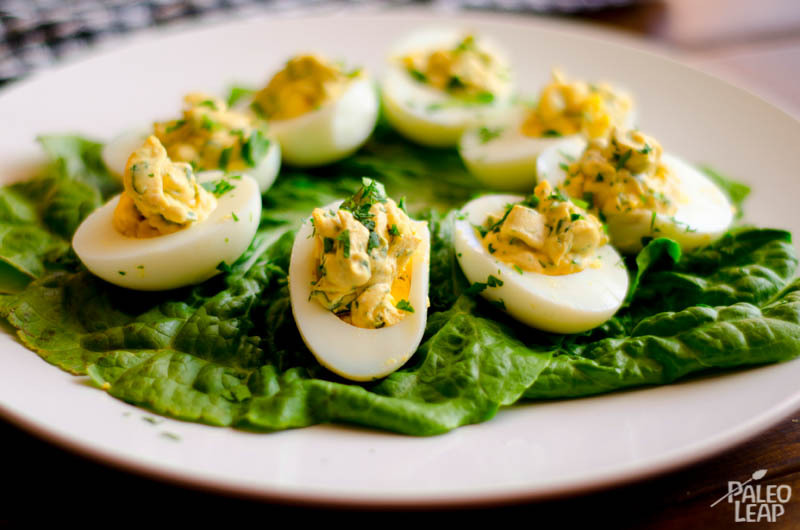 This recipe certainly beats any plain old deviled eggs I have ever had! The main reason is because everyone seems to share the exact same deviled eggs recipe. It’s as if there is only one way to make them. And without a doubt, you know that if you are attending any kind of gathering there will be more than enough of them to go around. This is why this centuries old appetizer has left me so uninspired and unwilling to even attempt something better. So I haven’t really, until I recently came upon this recipe and it sparked enough of my interest that I thought I would give it a try. It actually went so well that it made the cut and I found it worth sharing with you. It certainly has the potential to become a favorite of your family and friends. Traditionally, deviled eggs are hard boiled eggs where the cooked yolk is blended with mayonnaise, mustard as well as salt and pepper to then be scooped back in the halved hard egg whites. Here the recipe is improved upon by adding ingredients such as lemon juice, Worcestershire sauce, garlic and parsley. These pungent, savory and salty ingredients bring a new depth of flavor to this classic appetizer and the resulting taste guarantees you that people will ask about the recipe. Of course, if you feel like making more traditional deviled eggs or you just don’t have the extra ingredients handy, you can follow the deviled eggs with bacon bits recipe from the Thanksgiving recipe roundup. This Paleo appetizer is absolutely delicious and can be enjoyed without guilt as we already know that eggs, and egg yolks especially, are a nutrition powerhouse and that the cholesterol found in the yolk is not only harmless, but actually desirable. Of course, good quality local eggs from well-fed and cage-free chickens are a must if they are available and are affordable enough. Begin by making hard boiled eggs. Now don’t be embarrassed if you haven’t quite mastered this skill yet. It seems like a lot of people struggle to properly boil an egg, so here are some helpful pointers. Place your eggs in a medium-sized saucepan and then cover them with cold or lukewarm water. Place the saucepan over high heat and let the water come to a boil. As soon as it does, immediately reduce the heat to low and continue cooking for no more than 10 minutes. You must time this, as just a minute more or less can completely mess your eggs up! Right at the 10 minute mark remove the pot and place it under a faucet of running cold water. Once the water in the pot in ice cold, you can turn it off and allow the eggs to cool longer. In the mean time, you can start preparing the filling for the eggs. In a small bowl, whisk together the mayonnaise, mustard, Worcestershire sauce, if using, lemon juice and one tablespoon of the parsley. Heat a small skillet over a medium-high heat and toss the garlic in the olive oil. Saute for just a minute, until the garlic starts to turn golden brown. Remove from the heat and mix in the other filling ingredients. Once the eggs have cooled, peel the shells and cut each egg in half. Using a small spoon, scoop out the yolk and add it to the rest of the filling mixture. Give it a good mix and then add salt and pepper to taste. When you are satisfied with the filling, it is time to stuff the eggs. I used a pastry bag to do this part, as I find it difficult to try and spoon the filling into such a small space, all the while trying to make it look presentable. Be sure to fill each egg white generously. Line a large platter with the Romaine lettuce leaves. Place the completed eggs atop the lettuce, sprinkle the remaining parsley on top and you are ready to serve! Now I am not going to lie, you and your guests will have a garlic breath, but it is way worth it! Enjoy!